It’s always fun to get together with friends and share a few bottles over a delicious dinner. Although the Polo Bar is quite a scene, I have always found the food to be terrific, as it was once again this night. I have to admit that seeing what was once the flagship Ralph Lauren store on 5th Avenue closed is a somber reminder of the state of retail in the world right now. But back to food and wine. I opt for a fairly light dinner, or so I think, until desserts arrive. 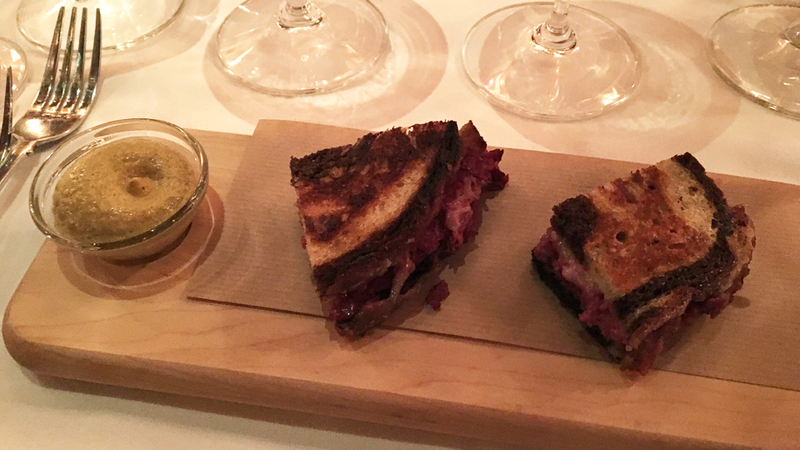 The Polo Bar’s corned beef sandwich, shared amongst us, is superb. I won’t claim to be a corned beef expert, but the Polo Bar’s rendition of this adopted New York City classic is delicious. 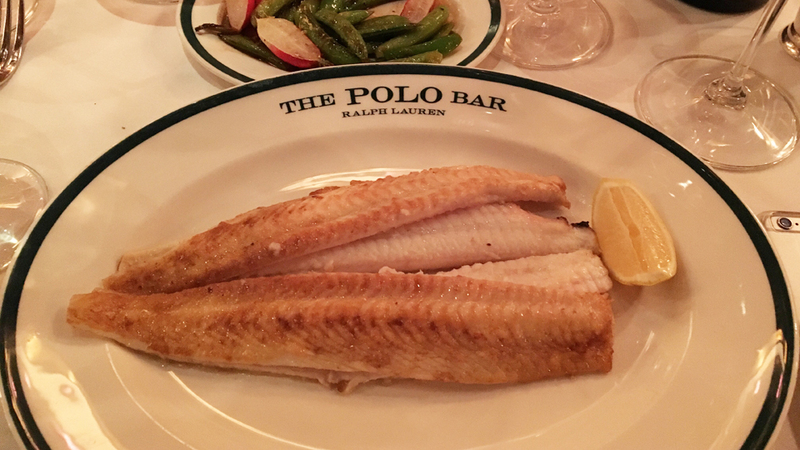 The Polo Bar also does a fabulous job with Dover Sole, which on this night is served with fresh vegetables. So far, so good. All intentions for a light dinner went out the door when desserts arrive. I don’t have a huge sweet tooth, but the Polo Bar’s ice cream sundae and classic cheesecake are impossible to resist and absolutely delicious. Our wines are pretty special too. As usual, the Polo Bar’s Wine Director Darnell Dodson lavishes these bottles with the care they deserve. Coche-Dury’s 2006 Corton-Charlemagne is in a perfect spot for drinking today, as it is just starting to soften and show the first signs of aromatic development. This is a fabulous bottle, with plenty of life ahead of it. Méo-Camuzet’s 1990 Vosne-Romanée Au Cros Parantoux is tremendous. Deep and richly textured in the glass, the Cros Parantoux captures all the radiance and natural intensity of the year’s layered dark fruit. There is not much subtlety here. Unctuous and exotic in every way, the 1990 proves to be utterly irresistible and compelling. Sadly, this bottle of the Domaine de la Romanée-Conti’s 1990 La Tâche is flawed. The 1990 can be an epic wine, but that is not to be on this night. There are no such issues with the 1990 Grands-Échézeaux, which is superb. In particular, the Grands-Échézeaux manages to convey the richness of 1990 while retaining a level of translucence and medium-bodied structure that is hugely appealing. Aromatically intense and silky, with striking purity in its fruit, the 1990 is hauntingly beautiful. Silky, floral and lifted, Dujac’s 1990 Clos Saint-Denis shows the more restrained side of the year, with noticeable aromatic lift and whole cluster nuance. 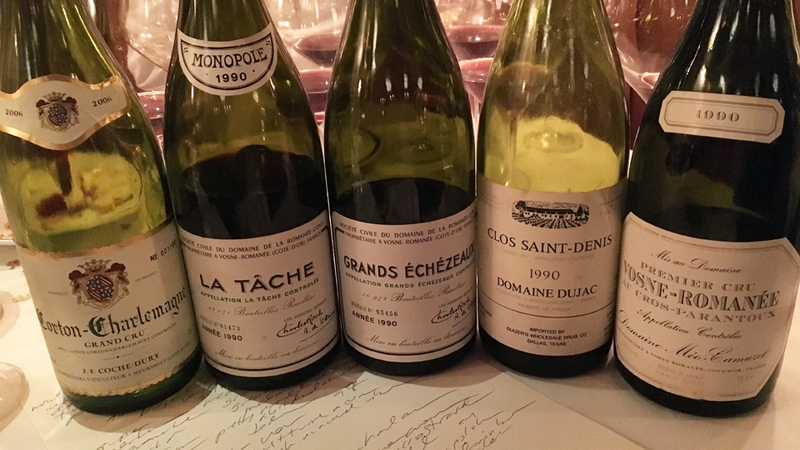 Medium in body and gracious, the Clos Saint-Denis is an understated Burgundy that is ideal for readers who find the style of 1990 to be too opulent. Time in the glass helps the wine’s elegance come through nicely. It’s a school night, so dinner wraps up early. The chance to follow these wines with a small group of intimate friends is a fabulous way to kick off the week.